Designer BETTY LOU PHILLIPS’ Guest Bath in House Beautiful: Gold antiquing and brass hardware dress this vintage display cabinet up to live amongst luxurious bath furnishings. “apothecary cabinets,” I discovered a multitude of vintage display cabinets! They’re largely metal, and a few are wooden. Most include one to three sides in glass, and are used for storage and display. and were originally used as medical dispensaries. Some of these have enamel tops or trays and are made of steel. They were originally meant for storage in doctors’ and dentists’ (gulp!) offices. The above photo, from the Librairie Alain Brieux (Parisian seller of antique and out-of-print medical books and paraphernalia), portrays the original uses of these cabinets. These aren’t your typical Victorian Curio Cabinets; they were never meant to go into residential homes. These cabinets are partially if not completely for display, whereas those in my recent post consisted of storage (drawers) only. The genre is the same if not a close cousin. 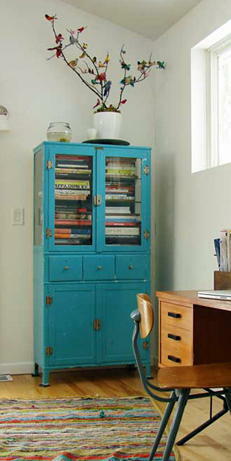 VIA retreat173 via flickr, lively yellow paint brings this vintage cabinet to life! An à propos botanical chart and bold blue walls form an exciting backdrop. 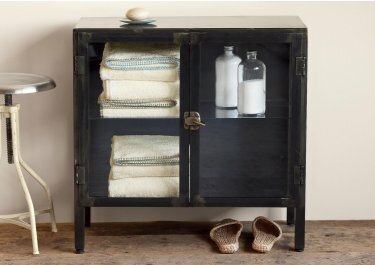 These vintage storage cabinets are far from Victorian fluff; rather, they match today’s obsession with “industrial chic” items (see luxe, glass-front refrigerators of recent years). And although most of these pieces have squared edges and clean lines, a certain “S-curve” is present in quite a few of them (we won’t say Queen Anne, but), perhaps a holdover from the Victorian love of rounded and embellished lines. drugstore chic and the era and means of Deyrolle. It’s also linked to early 20th-century science labs….and sometimes includes masses of vintage Ball and Mason jars! LEFT: 1930’s Medical Cabinet via flickr, RIGHT: RINNE ALLEN via flickr. 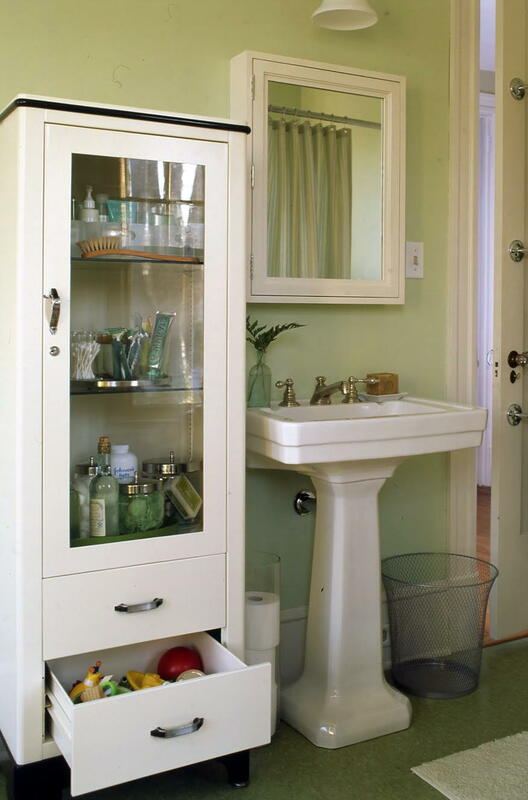 Cabinets from the 1950’s and beyond tend to have a closed base with glass-front top. Some are wooden as opposed to metal. These pieces seem best in a non all-vintage space. They garner the attention they deserve when carefully mixed with furnishings and accessories of various periods. I love the whole vintage-shabby-chic of today (which is fresh and different from that of the 90’s) but think these pieces look best when not mixed with too much of the same….where they may appear junky instead of smart. Although the above is a refrigerator, (likely used to display desserts in a French restaurant) its appearance falls enough into the industrial cabinet category to be quite the “home accessory” for some lucky individual; especially as it bears the luxury FAUCHON brand. Odds and ends stored in glass containers and Ball or Mason jars are everywhere these days, as are collections of colored glass bottles. The same goes for vintage tins, clocks and pharmacy paraphernalia. Perhaps tougher economic times in recent years have created a need for something small, less expensive, but still fun to hunt for at flea markets and attic sales. How to find one? They are on First Dibs and ebay…but you’ll likely pay less at a flea market or, better yet, a garage sale! If you find one at a decent price, scoop it up and ask questions later! So use one of these in your bathroom! Turn it into a bar! Use one as a side table in your living area! 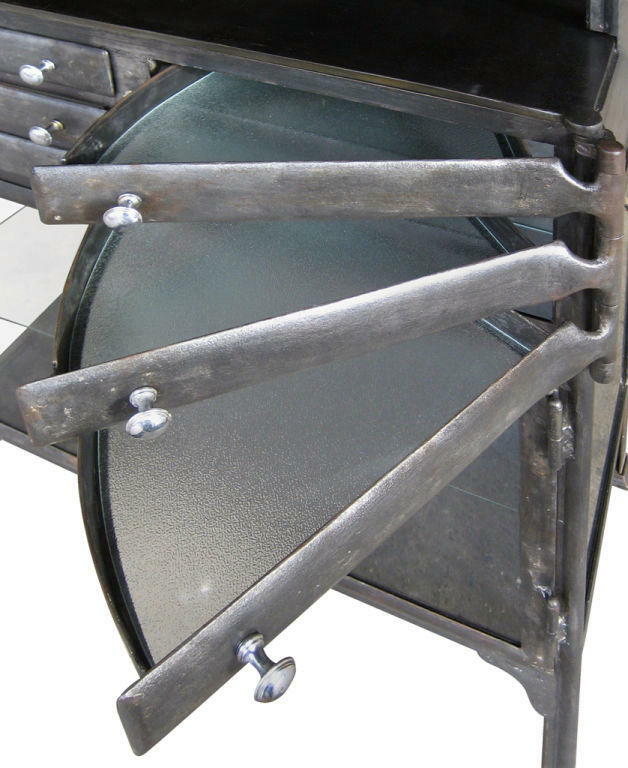 There is no end to the “industrial chic” product out there to be found. 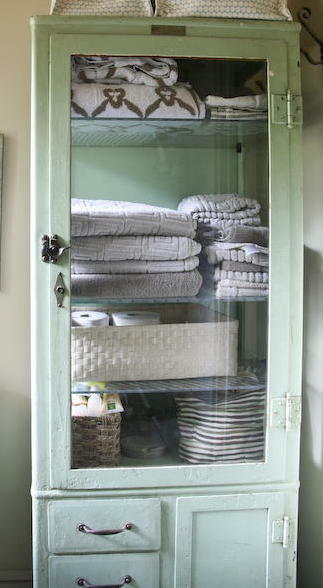 If you can’t find a storage cabinet, look for lockers, credenzas, (large) file drawers, and what have you. The list goes on, and these pieces are here to stay!